Had Frederick G. Williams apostatized when Joseph Smith died? What should I do when I don’t seem to get answers to my prayers? Except for a six-and-one-half-year gap, men of the Richards family have served as General Authorities continuously from 1840 to the present. In addition, members of this large Mormon family have made and are making significant contributions in other areas. From the early Richards converts to present-day heirs of that conversion, men and women of the Richards family have demonstrated the kind of faith and dedication to Church, family, and society that can well serve as an example to us all. Willard Richards (1804–54), son of Joseph and Rhoda Howe Richards, became acquainted with the gospel in 1835 when he received a copy of the Book of Mormon near Boston, Massachusetts. “God or the devil has had a hand in that book,” he said, “for man never wrote it.” After reading the Book of Mormon twice in a ten-day period, however, he was convinced it was of God. Because of illness, Willard was unable to join the Saints in Kirtland until 1836, but once there, he was baptized by his first cousin, Brigham Young. From 1837 to 1841, Willard served a mission in England. There he married Jennetta Richards, a Protestant minister’s daughter, who was the first person confirmed a member of the LDS Church in England. On 14 April 1840, while still in England, Willard was ordained an apostle and member of the Quorum of the Twelve in accordance with a revelation given almost two years earlier through Joseph Smith (see D&C 118:6). Soon after Willard arrived in Nauvoo, Illinois, in 1841, he became private secretary to Joseph Smith and remained with the Prophet almost constantly, even in Carthage Jail on 27 June 1844. Just before the mob rushed the jail, Joseph asked Willard if he would accompany him into a room that was supposed to be safer. Willard answered, “Brother Joseph you did not ask me to cross the river with you﻿—you did not ask me to come to Carthage﻿—you did not ask me to come to jail with you﻿—and do you think I would forsake you now? But I will tell you what I will do; if you are condemned to be hung for treason, I will be hung in your stead, and you shall go free.” Moments later, the mob entered the jail, killed Joseph and Hyrum Smith, critically wounded John Taylor, but miraculously failed to injure Willard Richards. “I scarcely know how to reply to Uncle Roger’s kind and generous offer. I presume you understood the doctrine my Father taught, the system of faith and Worship he believed in and practised as long as he lived and the same my Brother is striving to teach to all who desire to learn. My religion and my faith in the principles of our gospel is and ever will be the same as theirs. You have, I believe held out the greatest inducement that could be offered to make me forget it but even that, great as it is, could not make me swerve for an instant in the course I am now pursuing. If I could have the same Opportunities and advantages here I would embrace them gladly but as it is I can only thank you all kindly and sincerely for the good I feel you desire to do me were it in your power.”2 She married Benjamin F. Knowlton and raised a family in Utah. Other descendents of Willard Richards have had successful careers in law, business, medicine, politics, and the arts, along with serving on general boards of Church auxiliary organizations. In 1873, Levi W. married Louisa Lulu Greene (1849–1944). Louisa, who at the age of fourteen had been composing poetry and dramatic dialogues, was an accomplished writer whose poetry was printed in various Church publications and in the Church hymn book. When Louisa was twenty-two, President Brigham Young called her to become the first editor of the Woman’s Exponent in 1872, which was one of the first magazines published by and for women west of the Mississippi. The motto on the masthead of the publication was “The Rights of The Women of Zion, and the Rights of the Women of All Nations.” She served as editor for five years, but asked to be released after two of her children were born. Levi (“Lee”) Greene Richards (1878–1950), son of Levi W. and Lulu Greene Richards, was a portrait artist whose paintings of the General Authorities hang in the Historical Department of the Church and elsewhere. At the annual Salon d’Automne in Paris in 1921, Lee Greene Richards was honored to be the only American and only English-speaking judge of the art competition. Phineas Richards, Willard and Levi’s brother, is father of another distinguished Richards line. His son, Franklin Dewey (1821–99), served several short missions prior to his marriage to Jane Snyder in December 1842, but in May 1844 he was called on a mission that required him to leave his young bride in Nauvoo. With heavy heart, Franklin obeyed the call of the prophet. At that time, he wrote: “O God, extend thine arms of love Around the partner of my heart, Since thou has spoken from above And called me with my all to part.” After serving another mission in England from 1846 to 1848, Franklin D. Richards was ordained an apostle on 12 February 1849. Jane married Franklin D. Richards in 1842. During the first fifteen years of their marriage, her husband was on Church missions for a total of ten years. The most difficult of these separations occurred in 1846 as Jane was preparing to leave Nauvoo for the West at the same time that her husband was called on a mission to England. While on the pioneer trail in Iowa, Jane delivered a son, Isaac, in July 1846, but he died shortly thereafter. She was still numb from that shock when her two-year-old daughter, Wealthy, died. By this time her husband’s plural wife, Elizabeth McFate Richards, lay seriously ill with tuberculosis, and Jane gave her continuous care until Elizabeth died in March 1847. During this period of severe trial, President Brigham Young told Jane: “It shall be said of you that you have come up through much tribulation.” Although she lost her first two children on the pioneer trail, Jane bore four other children who lived long lives in the Latter-day Saint community. Sacrifice was also demonstrated in the lives of three of the brothers of Franklin D. Richards. George S. Richards, a fifteen-year-old convert to the Church, was living at Haun’s Mill in Missouri where several Mormon families had gathered in 1838. On 30 October 1838 young George was among those brutally murdered when a mob of anti-Mormons attacked the camp. Eight years later, another of Franklin D.’s younger brothers, Joseph W. Richards, volunteered to join the Mormon Battalion on its historic march to California during the war between the United States and Mexico. While on that military mission for the Church, in service of the United States government, Joseph became ill and died 19 November 1846 at Pueblo, Colorado. Josephine Richards West (1853–1933), a daughter of Franklin D. Richards and Jane Snyder Richards, served as a counselor to the general president of the Primary from 1896 to 1905, was twice a delegate to Washington, D.C., in the cause of women’s suffrage, and was the first president of Weber County Daughters of the Utah Pioneers. She married Joseph A. West in 1873 and bore six children, one of whom, Franklin L. West, became Church Commissioner of Education from 1935 to 1953. Elder George F. Richards served as a member of the Council of the Twelve from 1906 to 1950. 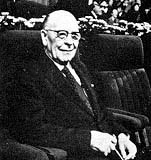 His son, LeGrand Richards, was born in 1886. As a young boy, LeGrand had several accidents that could have taken his life: once as a small child he was struck in the head by an ax as he approached his father from behind while his father was chopping wood. A few years later LeGrand was thrown from a wagon by agitated horses, and the wagon wheels passed over his head twice. At the age of nine, he was stricken with a bone disease in his hip that has caused him in later years to use a cane for support. Elder LeGrand Richards was called as Presiding Bishop of the Church in 1938. In 1952 he was called into the Council of the Twelve. Another grandson of Apostle Franklin D. Richards and first cousin to Elder LeGrand Richards, is Elder Franklin D. Richards of the Presidency of the First Quorum of the Seventy. Born in 1900, Elder Richards received his LLB degree from the University of Utah Law School in 1923, and after practicing corporate law for a period of time, became an administrator with the federal government. From 1934 to 1952, Elder Richards served with the Federal Housing Administration and then returned to Salt Lake City to lead several loan and investment companies. He served as president of the Northwestern States Mission beginning in January 1960, and then, on 9 October 1960, was called to serve as an Assistant to the Quorum of the Twelve Apostles. On 1 October 1976, with the reorganization of the First Quorum of Seventy, Franklin D. Richards was called as the senior president of the presidency of the First Quorum of the Seventy, which position he continues to magnify. The lives of these representative men and women of the Richards family give us many examples of the challenges, sacrifices, and opportunities for service that can come in the Lord’s work. Through the generations, the Richards family has created a living heritage of faithfulness, a spiritual birthright for their family that is worthy of emulation by all Latter-day Saints. Andrew Jenson, Latter-day Saint Biographical Encyclopedia, 4 vols. (Salt Lake City: Andrew Jenson History Company, 1901–36), 1:53–56; History of the Church, 6:616. Autobiography of Ezra Clark Knowlton, Part One (Provo, Utah: J. Grant Stevenson, 1967), pp. 65–66. Gordon B. Hinckley, “President Stephen L. Richards, 1879–1959,” Improvement Era, June 1959, pp. 417, 488–89. Improvement Era, July 1953, p. 498; Mae Richards Fotheringham, Stayner Richards, Our Father (Stayner Richards family, 1976), p. 143. Jenson, LDS Biographical Encyclopedia, 3:703–6; History of the Church, 6:366. Leonard J. Arrington, “Louisa Lulu Greene Richards: Woman Journalist of the Early West,” Improvement Era, May 1969, pp. 28–32. Jenson, LDS Biographical Encyclopedia, 1:115–121; Franklin L. West, Life of Franklin D. Richards (Salt Lake City: Deseret News Press, 1924), pp. 55, 239–42; Franklin D. Richards journal, Church Hist. Dept. Archives. Jenson, LDS Biographical Encyclopedia, 4:195; Connie Duncan Cannon, “Jane S. Richards,” in Sister Saints, edited by Vicky Burgess-Olson (Provo, Utah: Brigham Young University Press, 1978), 175–96. Jenson, LDS Biographical Encyclopedia, 1:813–14. Jenson, LDS Biographical Encyclopedia, 2:700, 4:194; Maurice Tanner, Descendants of John Tanner (Tanner Family Association, 1942), 96–98. Jenson LDS Biographical Encyclopedia, 4:245; Journal of George F. Richards, Church Hist. Dept. Archives. LeGrand Richards, Just to Illustrate (Salt Lake City: Bookcraft, 1961), 167–76. D. Michael Quinn, associate professor of history at Brigham Young University, is a high councilor in the Salt Lake Emigration Stake. Old mission house and store in Laie, Hawaii, where Henry P. Richards, younger brother of the first Franklin D., served as a missionary. Emily S. Tanner Richards (circled), photographed with other women active in the women’s suffrage movement. Elder Franklin D. Richards speaking in conference. Franklin D. Richards was called to the Quorum of the Twelve in 1849. President Stephen L Richards, center, with President David O. McKay and President J. Reuben Clark, Jr., the First Presidency from April 1951 until Brother Richards’ death in May 1959. Elder and Sister George F. Richards. Stayner Richards as president of the Highland Stake in Salt Lake City. Willard Richards with his wife, Jennetta, and their son, Heber; posing for a daguerreotype in Nauvoo in 1845. Stephen L Richards was a grandson of Willard Richards. Louisa Lulu Greene Richards was called by Brigham Young to serve as the first editor of the Woman’s Exponent. The sword [not] shown was carried by the Mormon Battalion, in which Joseph W. Richards, younger brother of the first Franklin D., served.